165# dink on Weaver davits? I have the opportunity to buy a Brig 330 11' dink that weighs 165#. This would mount on my 1983 36' Albin DC with Weaver davits. I have a mast/boom to assist in tiliting it up on the swim platform. Has anyone used this combination? I'm concerned about the weight. 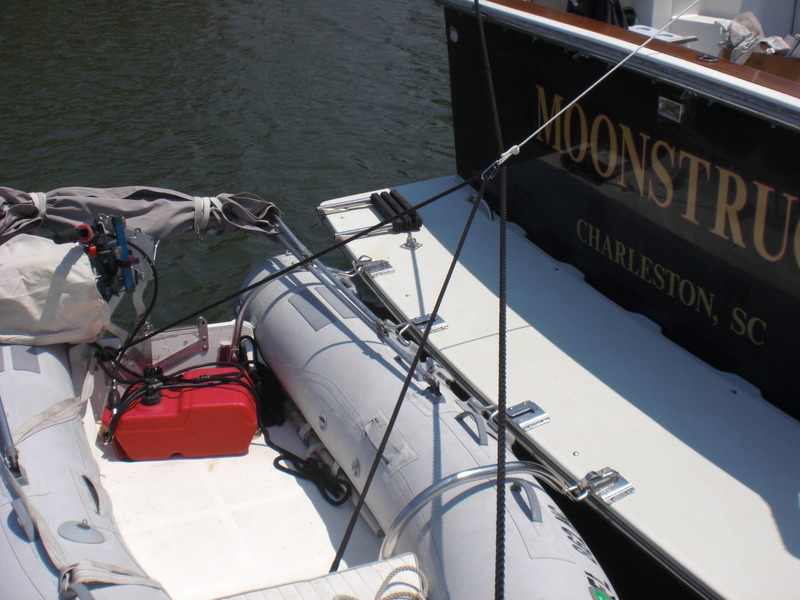 We have a 100# Mercury 10'2" inflatable that is mounted on Weaver snap davits w/o any problems. We recently acquired an 8hp motor that is mounted on a transom bracket & taken on & off the dink w/ a St Croix crane. I pull the dinghy up from the cockpit with out any excessive effort. frankly, my biggest concern would be the swim platform's support system & condition. I don't see any problems handling things otherwise. That much weight is a lot of stress on the tubes and glued on pads. I would recommend that you go with the hard mounted transom and bow arcs that Weaver has. They have bow arcs that will mount on the floor or on the bow locker if you have one. We changed to these, and find them much better. Weaver is really good to work with. I agree with Don. We have a 190# RIB, and have the rear arc but only the pad mount for the front. I believe Don did the front arc a year or so ago and that is the way to go in my opinion. For me, it's on da list! Great info, Moonstruck and Forkliftt. Do you guys hoist the dink with the motor still attached or do you disconnect the OB and transport it on a transom bracket like CHC? Also, do you have a winch or pulley system to assist in the lift? We have a 160# Livingston LV9 hard dink on a Weaver system... With the weight of a 8hp outboard AND a 250# captain, our Taiwanese teak platform holds just fine. Chuck on The Trawler Beach House uses the same rig. We just mounted the davits close to the supports and it's not a problem at all. 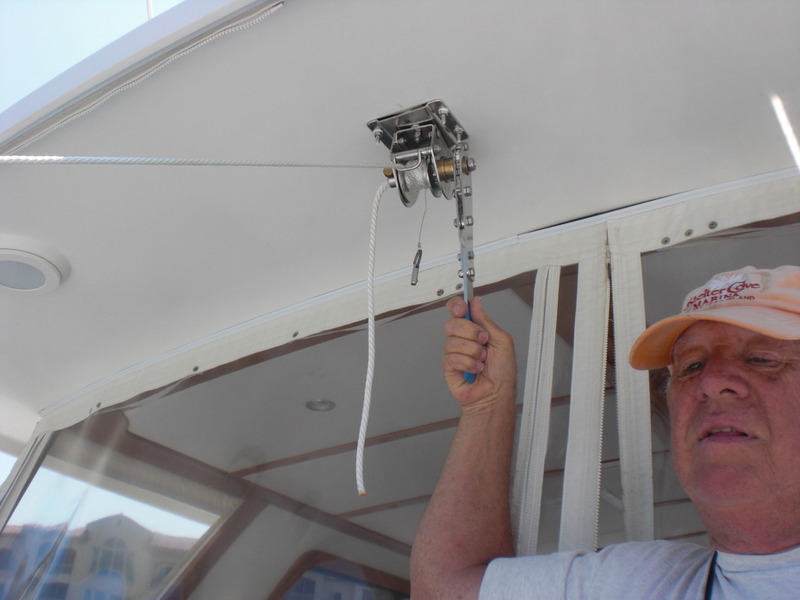 We have a simple block-and-tackle to pull it up and it's quite easy to do. There's a fellow in our club with a GB36 Europa. He just added a 10' Bullfrog dinghy with a 15hp Honda to his swimstep using snap davits and a manual Seawise davit. The Bullfrog is 225 lbs. I don't know what a 15hp Honda weighs. Everything is mounted on the factory original swimstep. However the yard that did the work put a reinforcing bronze extrusion across the rear of the swimstep and fabricated three additional stainless steel supporting L-brackets for the swimstep-- two under the Seawise mount which also carries the weight of the motor and one under the other snap davit at the other end of the swimstep. The stock GB swimstep is supported by four buit-up bronze brackets. This was determined to be considerably less support than would be required by the Bullfrog and motor. As we plan to acquire a 10' Bullfrog ourselves this was great to see last weekend as we had figured to have to tow the dinghy when we got it. Instead we'll have the same yard install the same system on our boat. OK, Flywright, like I tell Troy, our dog, when trying to get him to poop on the pad in the cockpit, I'm going to show you how one more time. So, pay close attention here. Our Caribe dinghy weights about 165#. The 15hp engine weighs 79#. With 6 gal fuel and assorted things in the bow locker, I figure close to 300# total. That is quite a lot of weight, but a great dinghy. I have a bracket for a removable stainless steel and brass come-a-long mounted on the hardtop overhang. The motor stays on the dinghy on a Weaver Leaver. That is a great invention. I like the Seawise system. Very solid, but much more expensive than the Weaver system. 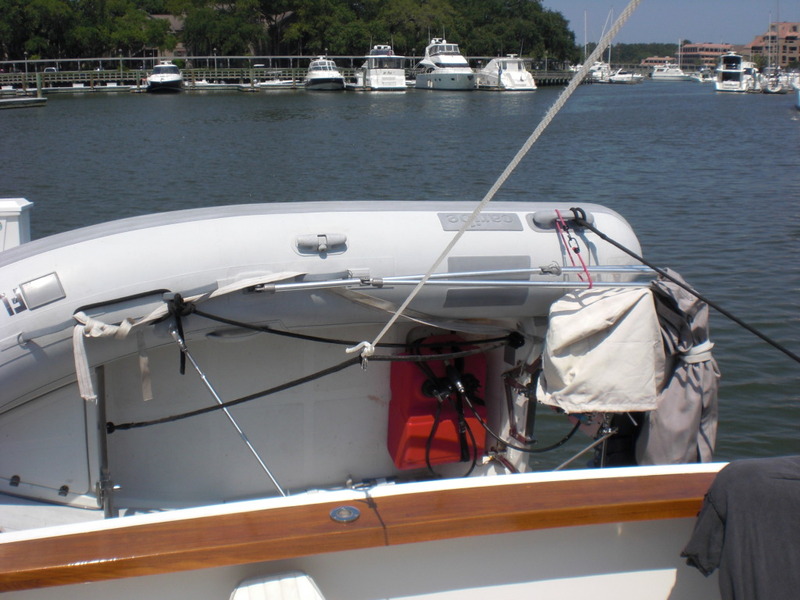 Having most all the dinghy equipment stored on the stern is much better than dealing with hoisting an engine and dealing with gasoline aboard. "OK, Flywright, like I tell Troy, our dog, when trying to get him to poop on the pad in the cockpit, I'm going to show you how one more time. So, pay close attention here." Thanks for the boat pics. Now that I see them, I remember you posting that come-along pic before. The davits look great! So you train by example? That brings a disturbing image to mind and a whole new meaning to the "Moon" in "Moonstruck".